This three-storied temple is a wonder of architecture that comprises beautifully carved pillars, decorated ceilings, painted walls and lush halls. In those times, 1.5 million rupees were spent to raise this structure. The spire of the main temple is around 79 feet high that undoubtedly dominates the skyline of Udaipur. This shikhar (spire) is festooned with sculptures of dancers, elephants, horsemen and musicians making it truly a sight to behold. As and when you approach the temple, you will be welcomed by two huge stone elephants at the entrance. On the very front of the temple, you would find a stone slab that is imprinted with the inscriptions with reference to Maharaja Jagat Singh. To reach the main shrine, you have to take a marble flight of 32 steps. Here, you will find a brass image of Garuda, a figure of half-man and half-eagle. This huge idol stands as if; it is guarding the doorway of Lord Vishnu. Note: The darshan timings of the Jagdish Temple might be change during festivals and special days. 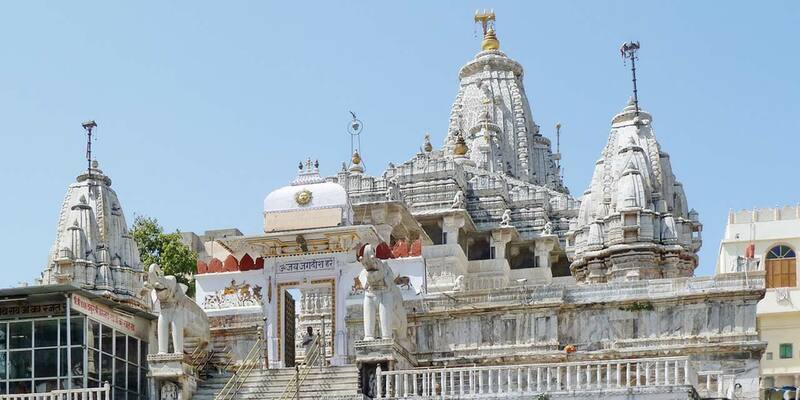 Note: The Aarti timings of the Jagdish Temple might be change during festivals and special days. A tourist would experience just as much delight in the temple as a devotee would given the beautiful architecture of the shrine. During a tour of the City Palace, the Jagdish temple is always recommended as it depicts the kind of architecture and design the Mewar dynasty of Rajasthan was passionate about. Jagdish Temple is located in inside the City Palace Complex of Udaipur. One can easily reach by local means of transport. Udaipur is well connected by road, rail and air.